In the following, I have included all populations from Human genetic variation: the first ? components that had "West Eurasian" admixture of at least 75% at K=3. I have also added some additional populations from Xing et al. and a number of Dodecad Ancestry Project populations, including some making their debut; sample sizes in several old populations have increased due to participation in the current submission opportunity. The number of markers is ~37k in order to include the greatest variety of populations, but as will be seen, the ability to detect structure is not greatly diminished. Some South Asian populations were above the 75% cutoff and form their own cluster at the bottom, with the isolated Kalash at some way off. The island of Sardinia is its own island in genetic space as well. The most distinctive feature of this plot is the separation of Europeans from West Asians. The big hole framed by Chuvash (bottom), Greeks, Italians, and European Jews (top), Europeans (left), and West Asians (right) and probably reflects barriers to gene flow by the Black Sea and Aegean. A fairly linear cluster to the right of this hole contrasts people from the Caucasus (Urkarah, bottom) with those from Arabia (Yemenese Jews, Saudis, Bedouins). The distinctiveness of several populations is discovered by MCLUST using just the first two dimensions, confirming our visual impression, e.g., #13: Chuvash, #12: Kalash, #3: Sardinian. Other clusters, correspond to multiple populations, e.g., #9: Caucasus, and #10: Arabians. In the latter case, as I have mentioned several times before, we should not conclude that these populations are identical, but see whether they can be divided using additional MDS dimensions. Indeed, using just 4 dimensions, MCLUST infers 46 clusters. Even more clusters can be inferred with the usual set of 177k markers and more MDS dimensions, but, for now, I just wanted to make the point that even the smaller number of SNPs suffices to uncover population variation. This allows us to amortize genotyping efforts using different chips with relatively few markers in common with most of the populations included in the Dodecad Project. What does this consistant connection between Tuscany and Greece mean? Were the Greeks Etruscans, were the Etruscans essentially nGreeks, or is this an earlier Appenine culture connecting the two? Who is in the Balkans_D group? I suppose most of them are Slovenians or Croats since 4 of them cluster with northern Europeans. Serbs, Bulgarians, etc. would probably cluster with southern Europeans, which is probably what that one Balkans_D member in cluster #2 is. Here's a refined version of the plot. It excludes all Jews, which made up 1/6 of the populations, and the several Caucasus samples that were unusually deviating towards the European cluster. It has already been pointed out by the admin of the FTDNA Armenian DNA Project that the samples of this population aren't from Armenia but from a group of Armenians living in Russia, and some of them show obvious signs of being partly Russian. This gives a clearer picture of the ancient genetic structure of West Asia. You can't just delete populations from an MDS plot, because the MDS plot is a function of the populations. Could you increase the size of the glyphs in the legend a little? I'm finding it impossible to distinguish some of them. One could see these things on previous maps too. Annie Mouse:Connection between Tuscans and Greeks? I doubt there is much if one takes MA migrations into account. Look at CHUvash almost balancing Sardinians, one the opposite of the other in longitude. Dienekes, why did you delete my comment about the location of the Jews? Presumably the Jews appear between the Greeks and the Cypriots because they have minor (10%) European admixture. A full spectrum of genes would reveal them as still over by the Jordanians. I didn't delete any comments recently. Where are you getting the figure that Jews (I presume you mean European Jews) have only 10% European admixture? Thank you. First time, as far as I know, Iraqi Kurds and Assyrians appeared on the same MDS plot. There are Slovenian participants in Dienekes Dodecad project. The Balkans_D is probably them and a maybe one Bulgarian. Yes, you cannot expunge ethnic groups from a set MDS plot. You have to do the MDS plot again without the ethnic groups that are not desired. European Jews are basically Europeans who practice or once practiced Judaism. Anyone with eyes can see that. If I remember correctly, there were also some Serbs in the Dodecad project. I wonder why they weren't included here. Balkans_D population includes (at present) all 5 non-Greek people from the Balkans who are in the project. So are we to understand that those are one Bulgarian, 2 Serbs, and 2 Slovenians? The same ones from the Lezgin admixture post? I need to think of a good place to advertise to the Swiss. I remember when I made a genetic research on Igenea, I became out Ydna Haplogroup E1B1B with ancient tribe beeing Slavic. There is no particular relationship between Y-haplogroup E1b1b and Slavs. Hammer et al. 2000* estimate about 12% European admixture in the Askenazi Jews of Europe. Second, despite their high degree of geographic dispersion, Jewish populations from Europe, North Africa, and the Near East were less diverged genetically from each other than any other group of populations in this study (Table 2). The statistically significant correlation between genetic and geographic distances in our non-Jewish populations from Europe, the Middle East, and North Africa is suggestive of spatial differentiation, whereas the lack of such a correlation for Jewish populations is more compatible with a model of recent dispersal and subsequent isolation during and after the Diaspora. 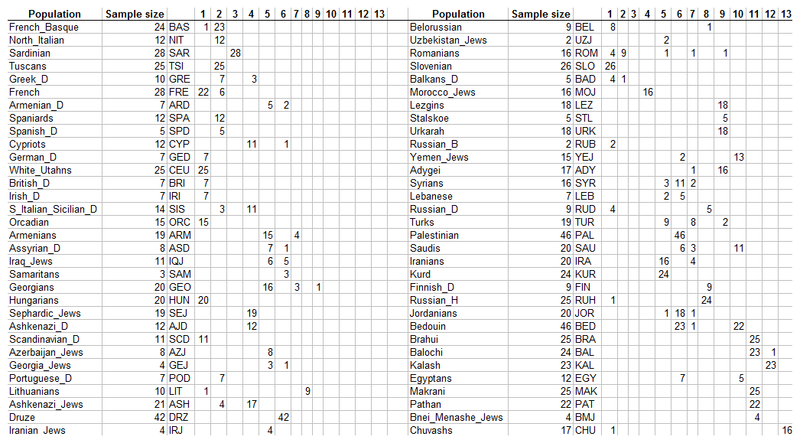 To address the degree to which paternal gene flow may have affected the Jewish gene pool, we estimated approximate admixture levels in our Jewish samples from Europe. This question remains unresolved in particular for the Ashkenazi community. Our results indicated a relatively minor contribution of European Y chromosomes to the Ashkenazim. If we assume 80 generations since the founding of the Ashkenazi population, then the rate of admixture would be <0.5% per generation (47). Interestingly, our total admixture estimate is very similar to Motulsky's (8) average estimate of 12.5% based on 18 classical genetic markers. However, the 18 markers in Motulsky's (8) study fell into two classes: a low admixture class and a high admixture class. Similarly, Cavalli-Sforza and Carmelli (48) found significant heterogeneity of admixture rates for different loci in the Ashkenazim. Because admixture should affect all loci to the same degree, there are two possible explanations for the heterogeneity: (i) admixture levels are actually low, and some loci are affected by convergent selection (e.g., in a common environment), or (ii) admixture levels are actually high, and some loci are experiencing stabilizing selection. Motulsky (8) interpreted the bimodal distribution of admixture values in terms of the former model. Because the NRY has few functional genes and is not likely to have been affected by recent selective sweeps (49, 50), our admixture results support the low admixture model. Phenotype does not necessarily indicate the underlying race. Jews spent almost 2000 years in Europe after the Romans destroyed Jerusalem in 70 AD a la the New Testament accounts. They gradually admixed at a rate of about 0.5% per generation to a total of about 12%. It seems that during that time the environment (natural and social) selected those acquired phenotypic traits that benefited survival. The Jews were diaspora in Europe so it is natural that the social environment selected those genes that contributed to an apparent European appearance. That way Jews seemed more like their host group and could 'fit in' better. Judaeo-christianity also helped them survive because the patristic and Medieval account had them as 'outcast deicides' and a 'cursed witness to the nations' a la Augustine and other church fathers, which gave them some protection. I have known many Greek and Jewish individuals and there is no chance of me confusing Jews with Greeks but then Jews did not dwell in Greece, so much as in Spain or Poland, though they tended to move around a lot from country to country because of regular expulsions. Some Jews have acquired a partial northern European appearance. However they remain 90% Jewish genetically with only about 12% European admixture. Likely a Jew would pass as looking 'European' in cosmopolitan cities more than in the more homogenous countryside where people are used to seeing a clearer distinct type. Haplogroups are not so important for your "Urvolk" You can be of Haplogroup E1B1B and be genetically closer to Slavs if the Rest of your ancestors were. This are the Results I got from Igenea and have been told by Fau Pazos of the Igenea Team. anyway I made a little mistake the Iraqi Kurds make up 1/7 of the kurdish people not even 1/4. On what basis were you ascribed to "Slavic tribe" by igenea? European Jews are basically Europeans who practice or once practiced Judaism. This statement makes very little sense since there are various genetic clusters in Europe. Jews are most closely related to Greeks and southern Italians but those populations may have significant Middle Eastern ancestry. From what I see most Jews are more closely related to each other than they are to non-Jews. I think there are arguments for removing certain populations to clarify what is going on. Heavily admixed populations for example. But the original (with all populations) should also be shown. On the Jewish stuff. Lots of selective commentary going on. As I understand it, traditionally, you are Jewish through your mothers line. (Personally I think you are Jewish if you think you are and know the traditions.) But there is no evidence, that I am aware of, of ANY Middle mitochondrial haplogroups in the Ashkenazi or Sephardi. The evidence for middle Eastern Y haplogroups is weak but believeable. They make up a small proportion of the Y haplogroups. I read this as a largely (possibly entirely) male Jewish population travelling to Europe and interbreeding with the local population. Once the culture was established there was heavy intra breeding within the Jewish community and a little with other Jewish communities in other nations. This established a characteristic genetic population. Maybe the Sephardi and Ashkenazi were distinct once but now they overlap heavily. That is not true; Jews do not form a single cluster. 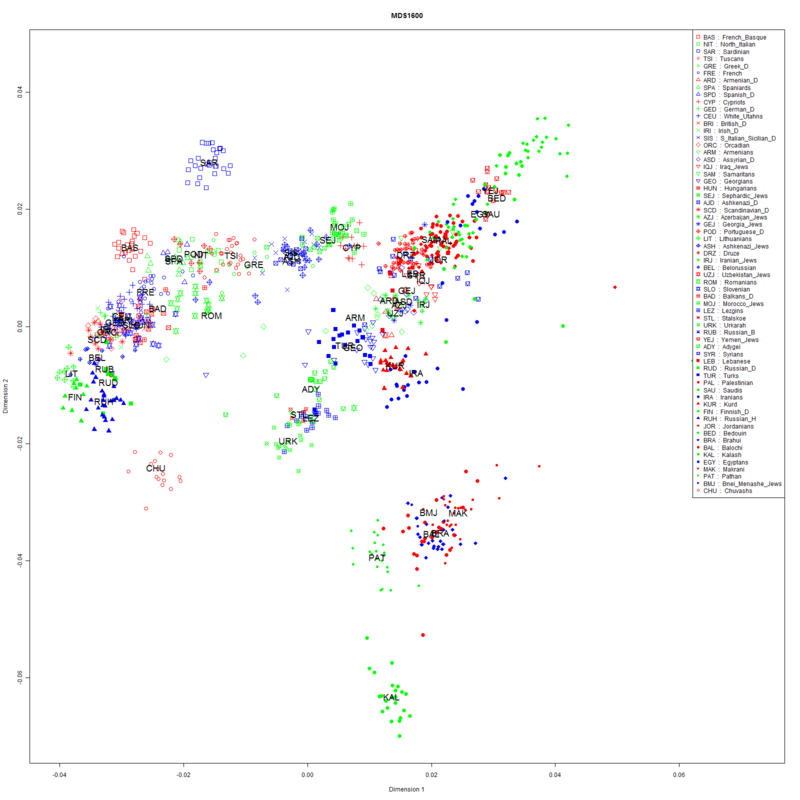 As both myself and the recent Jewish-genomics papers have shown, there are at least three clusters: Yemenese Jews, Middle Eastern Jews, and Ashkenazi/Sephardic Jews. Each of those deviates towards the direction of host populations, and this is consistent with substantial local admixture in at least 2 of the 3 main clusters. As for the supposed "Middle Eastern" ancestry in Greeks and Italians, Greeks and Italians are placed exactly where you would expect them to be along the continuum of populations from Europe to Asia. Of the Jewish groups only Ashkenazi, Sephardic, and Moroccan Jews are intermediate between Europeans and West Asians, and the simplest explanation is admixture. This is to speak clear and fortunately for you that nobody can ban you, being the forum of your own. I could add that not only that Jews are a mixed populations (all the other Jewish communities are put amongst their host populations), but that it isn't said that in this mixture there is something from Ancient Israel: they could be, like Falashà from Ethiopians and Jews from India from Indians, European Jews (Ashkenazim and Sephardim) from many European and North-African populations. We are always waiting the DNA from Ancient Jewish bones, perhaps more interesting than 8 teeth from 400,000 years ago. Nobody really knows how igenea (they are a FTDNA Reseller from Switzerland btw. FTDNA does the testing and they do some interpreting) puts you into these. But they do it by 12 Markers Y-DNA and the HVR1 of your mtDNA only. They dont use any autosomal material. I also did it once. The grandmother from wich this mtDNA originates was born near the German/Dutch border. These results never changed, even after updating to 67 Markers. When I updated my mtDNA Test to HVR2 it turned from "Germanic" into: "Slavic or Jewish". The 500 years estamination changed from "Germany" to "Central or Eastern Europe". The HVR2 still wasnt able to tell what subgroup of "K" it was. Back then, I chosed them, because they claimed to compare your DNA to that of ancient finds, to tell you the ancient people. Now, after having more knowledge I doubt this. "But there is no evidence, that I am aware of, of ANY Middle mitochondrial haplogroups in the Ashkenazi or Sephardi." "We are always waiting the DNA from Ancient Jewish bones, perhaps more interesting than 8 teeth from 400,000 years ago." Excuse me, but the 8 teeth from 400.000 are more interesting. Interesting is Cluster 3 which includes Sicily, Cyprus, and the western jewish groups. It seems the N.European ancestry which unites that grouping and separates it from Near Eastern groups. The addition of considerably Near Eastern ancestry also separates Cluster 3 from the Cluster 2 (ie: Basque, N.Italy). Another neat observation is Greek clusters with Cluster 2, where as Cyprus and Sicily did not, despite being geographically close. But there is no evidence, that I am aware of, of ANY Middle mitochondrial haplogroups in the Ashkenazi or Sephardi. AM, is it ok if I quote the Wiki entry (Jews) and you can follow up the references there? Jews appear to be mainly Middle Eastern on the female and male sides with minor (about 12%) European admixture on the male side. Before 2006, geneticists largely attributed the genesis of most of the world's Jewish populations to founding acts by males who migrated from the Middle East and "by the women from each local population whom they took as wives and converted to Judaism." , though no genetic relation was found between Jewish and non Jewish female lineages. However, more recent findings of studies of maternally inherited mitochondrial DNA, at least in Ashkenazi Jews, has led to a review of this archetype. This research has suggested that, in addition to Israelite male, significant female founder ancestry might also derive from the Middle East-with 40% of Ashkenazim descended from four women lived about 1000–1500 years ago in the Middle East. In addition, Behar (2006) suggested that the rest of Ashkenazi mtDNA is originated from about 150 women, most of those were probably of Middle Eastern origin. Approximately 32% of people with Ashkenazi Jewish ancestry belong to the mtDNA haplogroup K. This high percentage points to a genetic bottleneck occurring some 100 generations ago. Research in 2008 found significant founder effects in many non-Asheknazi Jewish populations. In Belmonte, Azerbaijani, Georgian, Bene Israel and Libyan Jewish communities "a single mother was sufficient to explain at least 40% of their present-day mtDNA variation". In addition, "the Cochin and Tunisian Jewish communities show an attenuated pattern with two founding mothers explaining >30% of the variation." In contrast, Bulgarian, Turkish, Moroccan and Ethiopian Jews were heterogeneous with no evidence "for a narrow founder effect or depletion of mtDNA variation attributable to drift". A study published by the National Academy of Sciences found that "the paternal gene pools of Jewish communities from Europe, North Africa, and the Middle East descended from a common Middle Eastern ancestral population", and suggested that "most Jewish communities have remained relatively isolated from neighboring non-Jewish communities during and after the Diaspora". Researchers expressed surprise at the remarkable genetic uniformity they found among modern Jews, no matter where the diaspora has become dispersed around the world. Other Y-chromosome findings show that the world's Jewish communities are closely related to Kurds, Syrians and Palestinians. Skorecki and colleague wrote that "the extremely close affinity of Jewish and non-Jewish Middle Eastern populations observed ... supports the hypothesis of a common Middle Eastern origin". According to another study of the same year, more than 70% of Jewish men and half of the Arab men (inhabitants of Israel and the territories only) whose DNA was studied inherited their Y-chromosomes from the same paternal ancestors who lived in the region within the last few thousand years. A study of haplotypes of the Y-chromosome, published in 2000, addressed the paternal origins of Ashkenazi Jews. Hammer et al. found that the Y chromosome of some Ashkenazi and Sephardi Jews contained mutations that are also common among Middle Eastern peoples, but uncommon in the general European population. This suggested that the male ancestors of the Ashkenazi Jews could be traced mostly to the Middle East. The proportion of male genetic admixture in Ashkenazi Jews amounts to less than 0.5% per generation over an estimated 80 generations, with "relatively minor contribution of European Y chromosomes to the Ashkenazim," and a total admixture estimate "very similar to Motulsky's average estimate of 12.5%." “Excuse me, but the 8 teeth from 400.000 are more interesting. But not for understanding the Jewish ancestry. It seems that those 8 teeth have taken the place of something other not found. The past days someone tried to make us believe that homo sapiens sapiens was born in Israel and that Bible may say this if interpreted not literally. Mr. Apostateimpression 123 or which ever you are, what you are quoting is written above all by Jewish geneticists, sponsored by Jewish Institutions, that I have criticized from many years gaining two banishments from two forums. Dienekes’ results are by autosomal markers and here it is impossible to lie. Mt.DNA K1a1b1a, the most diffused among Ashkenazi Jews, descend from my K1a1b1, that is surely Italian (I have the mutation 9932A). Hg. K hasn’t been found in the Jewish tombs around Jerusalem, for this we are waiting the Ancient Jewish bones test. Someone is thinking that K1a1b1a was in Eastern Europe, in fact it has been found among a Rom woman from Romania. I wouldn’t want that hg. K is like the Solomon’s temple, that nobody has found so far. We'll see what happens with these Israeli bones. Perhaps in the end things will be somewhere in between what Gioiello claims and the other extreme. I am a bit surprised by the large number of studies on Jewish populations. Gives an idea of what effect a religion can have. Other effects are car bombs, IED, etc. etc. I have read those papers and come to different conclusions. You have to look at the actual haplogroups they are talking about. I have no doubt that many haplogroups common in Ashkenazi today have been in the community for a long time. Some have even accumulated characteristic Jewish patterns of mutation in that time. But they are not originally Middle Eastern. Or at least there is no evidence, or likelyhoood, that they are. mi-Haplogroup K is just one example. I can buy that maybe some of the R1b1b2* results might turn out to be Middle Eastern when we get more detail (given King Tutankahmun's result). But we are not there yet. You are likely right that Jews are the result of admixture but Ponto is wrong in saying that Jews are basically Europeans who practice Judaism. Most Jewish populations - including Ashkenazi Jews - have significant Middle Eastern ancestry. Mitochondrial haplogroup N1b is possible but even that is more common in Georgians of Eastern Europe. "Haplogroup N1b originated in southwestern Asia and remains concentrated there today, reaching its highest levels among the Mazandarani of northern Iran and the Georgians of the Caucasus Mountains between the Caspian and Black Seas. It is also detected at lower levels among the Egyptians, Saudi Arabians, Bedouin and other Near Eastern populations." from 23 and Me literature. I've always found a little odd that most the PC plots show Italy closed to Portugal than Spain. Historically and geographically you might expect Italy to be closer to Spain. I wonder how Portugal is east of Spain on PC plots. Maybe the "eastern" influx (middle east and Italy/Greece) in Portugal was smaller than Spain, as expected, but their population was much smaller ie Portugals population is "younger". The other thing I'm thinking as to why Italy is closer to Portugal on PC plot is because Portugal has more North African, which is reasonable historically and geographically, and that n. African influence pushed Portugal eastward. Does someone know how Spain and Portugal relate to Italy differently? Dienekes, why do you separate Cypriots from Greeks? "Cypriots" is a sample collected/labeled by Behar et al., and consists of individuals from the Republic of Cyprus, probably Greeks as Greeks outnumber ethnic minorities in Cyprus (Armenians etc.) and the sample seems homogeneous. "Greeks" is a sample of Dodecad Project members. If enough people join the "Greeks" sample so I can split it even further according to my 5-person rule (e.g., there are 5 Cretans, or 5 Peloponnesians, or whatever other subgroup), then I will split it further. "The other thing I'm thinking as to why Italy is closer to Portugal on PC plot is because Portugal has more North African, which is reasonable historically and geographically, and that n. African influence pushed Portugal eastward. Tuscans and North Italians show any north african, nor west or east african admixture in any plot. The african admixture in Iberia, both Portugal and Spain, is by far larger than in North-central Italy and for what i know african admixture and levant admixture have nothing in common. Specifically Behar focuses on a group of K subclades and N1b. In Behars own paper Figure 2 shows all but one of the K subclades (light blue) rooted in Europe (red). One subclade is shown as rooted in West Asia. Does this experiment prove anything apart from that these 37,000 "markers" produce this plot map? Would it not be more informative about genetic distances if ALL of the genes were compared? How is it that the Greeks are shown as closer genetically to the Jews than to the Cypriots? And indeed how is it that that the Cypriots are shown as closer to the Jews than to the Greeks? How did the Jews come between the Greeks and the Cypriots? Surely a comparison of ALL of the genes would produce a very different picture? And how is it that the Greeks are closer to the French than to the Turks when the Greeks and the Turks are neighbours and they were part of the same empire for 1500 years under first the Byzantines and then the Ottomans? And the Belorussians are as close or closer to the Scots than they are to the Russians? Does this plot map not seem counter-intuitive? Is it any more than an experirment on a predetermined data set of 37,000 "markers"? You have your history wrong. Greeks and Turks were not part of the same Empire for 1500 years. Turks arrived in Anatolia in the 11th century, and the Greeks and Turks co-existed in the Ottoman Empire for a variable period of time, depending on locality, but certainly much less than 1500 years. Also, you are misinterpreting the plot by inferring genetic distances from distances along the first two dimensions; as I've said countless times genetic distances are not preserved by low-dimensional representations. The map captures the main features of the data at a broad context, it does not ensure that every pairwise individual (and population) distance is preserved. AM, Ashkenazi and Sephardic Jews have levels of male haplogroups I, R1a and R1b to a total of about 20%. That is in fact lower than their Middle Eastern Syrian neighbours. (Iran and Iraq also have similar levels.) So the male haplogroup evidence is contrary to any large-scale mixture between Jews and the Europeans of Spain or Poland or anywhere in Europe where Jews dwelt in large numbers. The other 80% of Jewish haplogroups comprise levels of G, J1, J2, E, T, L and Q that are normal for the Middle East and consistent with a Middle Eastern genesis of the Jews. Dienekes, I was talking about the people of Anatolia known today as Turks according to the normal manner of naming peoples and places, who you have said have only about 6% Turkic admixture. I was quite right to say that they were a part of the same empire as the Greeks for 1500 years, first the Byzantines and then the Ottomans, though there was of course local variations as the boundaries of the empires naturally expanded and contracted through the centuries. OK fair enough, as long as readers dont go away with the false impression that the Jews are genetically intermediate between the Greeks and the Cypriots or that the Greeks are genetically closer to the French than to the Turks. Dienekes, I was talking about the people of Anatolia known today as Turks according to the normal manner of naming peoples and places, who you have said have only about 6% Turkic admixture. First of all, it's not normal manner to label ancient people with modern names. The people who lived in Anatolia 1500 years ago were not Turks. Hell, most of them were not Turks until quite recently when the Turkish Republic decided to forge a Turkish nation out of the heterogeneous Muslim population of the Ottoman Empire. Second, I did not estimate a 6% Turkic input, I estimated a ~6% Mongoloid input and about 1/7 Central Asian Turkic input. I've already addressed the 1500-years part. Moving on to the substantive part of your argument, co-existence within an Empire does not mean obliteration of genetic differences. For example, the genetic differences of various peoples that were part of the Holy Roman Empire in Europe were not obliterated. When the Greeks and the indigenous ancestors of the Turks (Greeks, Armenians, etc.) were part of the same Empire you cannot assume that there was substantial intermarriage between them. Continental Greeks and Cypriots form distinct clusters even though they shared the same religion and language. Cretans have been shown to be distinctive from mainland Greeks by Y-chromosome analyses etc. Hence, you cannot assume a homogeneous pre-Turkish population stratum even in a population where there were no linguistic or religious barriers to gene flow. Regionalism has played an important role in the fragmented geological landscape of the Balkans and Anatolia since prehistoric times. Second, even if the Greek component in Turks was exactly like that of modern Greeks, you are forgetting that Turks also have non-Greek West Eurasian elements in addition to the aforementioned Central Asian/Mongoloid element. Finally, there were religious-political barriers to gene flow during Ottoman times, and gene flow was largely unidirectional. Hence, I do not share your befuddlement about the Greeks not being closer to Turks, and I've already mentioned four reasons (geographical Greek structure, Central Asian admixture, non-Greek West Eurasian admixture, the millet system of the Ottoman Empire) why they shouldn't be, just as we can observe with both our eyes and with genetics. Dienekes, there is no need for rude personal comments like "I do not share your befuddlement." Anyway, I was talking about genetic distances, I was not saying that Greeks and Turks are identical. I mentioned political union as one factor along with the main factor of geographical proximity so I think that your reply is really a straw man response. I think that you may be allowing possible anti-Turkish feeling to surface. I look forward to the day when we will have estimates of genetic distances based on ALL of the genes. I am confident that the Greeks will be closer to the Turks than to the French. By the way, you do use modern place names when discussing ancient migrations, like "India", "Syria", so why not Turkey? Why do you make an exception and use "Anatolia"? (2) 1/7 Central Asian admixture in Turks, including ~6% Mongoloid. (4) Psychological/political/religious arriers to gene flow in the Ottoman system. Incorrect. I argued why the observed clear separation is what it is; you may choose to accept the empirical evidence or to continue being puzzled by it, but I have already explained how the evidence is perfectly consistent with what one might expect. India and Syria are not modern names, they were used by the ancient Greeks to describe both India and Syria. Anatolia is a good term for the pre-Turkish population of Anatolia. To use "Turkish" for that population would be wrong both because it is an anachronism and because the Turs were historically a part of the Anatolian population, and, until recent centuries, a small part. 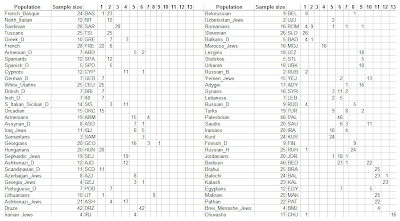 I have an idea: analyze the Greeks, Turks, Cypriots, Armenians, Italians, French and Jews separately (analyze them in different combinations for more clarity if you wish); this way you can preclude drags resulting from small scale admixture from distant populations. "I look forward to the day when we will have estimates of genetic distances based on ALL of the genes. I am confident that the Greeks will be closer to the Turks than to the French." The reason why Greeks are closer to French is because they do not have the Central, and East Eurasian components that Turks have. And if Greeks have this, it is considerably smaller than the Turks, and non-existant in French. The way I see this algorithm working is in a basic way. (I am not the strongest mathematician) The testee groups are assigned to a cluster based on the closest similarity. So for instance, Iberians, Greeks, French, Italians, Romanians and even Basque are assigned to Cluster 2 because they all share a very strong S.European component, and a fairly strong N.European component. Western Jewish groups, Cypriots, and Sicilians have a more mild N.European component with mild to medium Near Eastern, African, and Middle-Eastern components. This groups them together. I'm not sure why it's always the Western jewish groups that are stated as being mixed. You don't think other diaspora populations had any mixture? I don't think we will find the ancient jewish population because even Egypt and Jordan have strong African components which are not nearly as well represented among modern jews anywhere. (though at very low levels) So which group changed? Perhaps they all have in the last 3000+ years. @Dienekes Igenea used to have some extra Services like telling you at hand of your DNA from where your ancestors originated from. The Haplogroups doesen´t played much role. But after many People complained and there was big discussion about this ancient Folk clusters they stoped to do it.My english is not the best. I hope I could express my self. This is my shot at interpretating this data. It would be easier to understand if the chart was flipped to put the Beduin (closest to Africa) at the bottom left, paralleling geography. I see three separate trading/breeding blocks. The main thing I can see for Europe is that most of the populations are composed of variable admixtures of a Northern component (represented by Lithuania/Finland) and a southern component (represented by Northern Italy/Tuscany). Lets suppose at the end of the last Ice age there were 3 relevant isolated populations with their own unique characteristics. The northern population (Lithuania). A Southern component (represented by Sardinia). And a second Northern component (represented by the Chuvash or possibly the Kalash). Initially there was a recipricol flow of people between the Northern population (Lit) and the southern component (Sar) with the Basque representing an intermediate. This trade and flow probably occured just after the last glacial maximum as people reoccupied the land. Southern Europe only (Tuscany/ N. Italy) later receives additional genetic input from another population (lots of options here) pulling it down a bit. This could be the neolithic expansion, but I dont think it is because then modern Greece would be the terminus, but Greece is just a bit too far down indicating that the big population change representing the neolithic occured later. Then there is a second period of flow between the North Italian/Tuscan population and the rest of Europe, that somehow bypasses the Sardinians and Basques (notoriously exclusive and fierce peoples). At some stage the second northern population (Chuvash/ maybe Kalash) interacts with the first Northern component (Lit) pulling the Russians down off the line. The Chuvash may be representative of this population but I think the Kalash could be closer to the original population with the Chuvash an just another admixture. Greece is then pulled off the line with the neolithic expansion. I expected towards Turkish populations but the location of the Cypriots is puzzling and it may be that the pull was towards a population closer to the modern Druze/Samaritans. The intermediate Jewish cluster is consistent with European/Middle Eastern admixture followed by isolation (Sej, Ash etc). I think the near overlap with Greece and Cyprus is just coincidental. The Middle East and West Asia forms a block startlingly separate from Europe but with a similar North/South population flow this time between what may be Africa (top right) and a Chuvash like northern population. So along the Southern mediterranean coast and up into central Asia. Iran forms a separate population with a strong flow via the Kurds into Turkey. No apparent Iranic connection with Europe. The Indian tribals form a third block with surprisingly little connection (given the proximity) to the Middle-Eastern and Iranic block. There are again signs of a north-south flow between probably Africa and something similar to the Chuvash/Kalash. What is curious here is there is no evidence of a common root in India or the Middle East. Just establishment of three separate populations and separate North-South reciprocol flow of people. Plus the pequeliar second northern component which manages to interact with all three blocks at their most northern reaches. And seems to have no relationship to Iranic people. "I've always found a little odd that most the PC plots show Italy closed to Portugal than Spain. Historically and geographically you might expect Italy to be closer to Spain. It´s a good question, but Portugal and Spain always cluster together, here they both are in the cluster 2, just like N.italians, french basque and greeks. North african (caucasian E-M81) influx in iberia goes from 3% to 7%, in 2009 (Y) study it gives 7,1% do Portugal and 7,7% to Spain, here it gives more to Portugal and less to Spain. "I wonder how Portugal is east of Spain on PC plots. " I think it is because Portugal is coastal and so more exposed to new people arriving through coastal trade routes. What fraction of samples is from men? Is the cluster of the 5 to 10 Sardinians due to the I2A M26+ y-DNA found in the interior? This is impossible to read. Most of the 3 letter abbreviations are on top of each other and so totally illegible. Also the list of the abbreviations and names on the right of the diagram are not listed alphabetically, which makes it a real chore to try to look each abbreviation up. Will the religious inherit the earth?